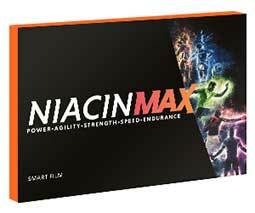 NiacinMax UK is a sports supplement designed to increase athletic prowess and improve muscle gains by providing the body with a fast-acting, easy-accessible dose of niacin (Vitamin B3). The product is manufactured by Wolfson Berg, a reputable company that has been trading for over a decade, and has a good reputation for producing quality products. Providing Vasodilation: A slight widening of the blood vessels that encourages improvements to the circulation and helps provide the muscles, brain and other vital organs with extra oxygen and nutrients. This enables an enhanced workout, faster recovery rates, and improved muscle gains. Boosting HGH: The benefits provided by HGH are many, including boosted testosterone levels, improved fat burning abilities, and enhanced muscle growth. 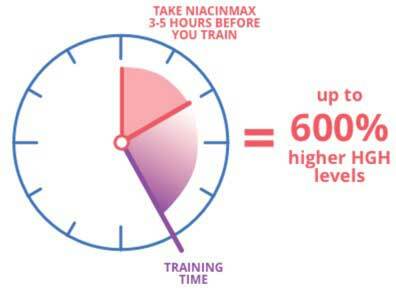 A number of studies, going back several decades, support niacin’s reputation as a HGH booster and people who boost HGH by using niacin can avoid the health risks associated with the use synthetic hormone injections. Each strip provides 75mg of niacin. There are no other active ingredients. The niacin used in the strips is coated with a unique liposome coating that prevents the niacin from being released before it reaches the cells. This is one the most interesting things about the product and it gives the strips a potency that more conventional supplements cannot match because a lot of the niacin in such supplements is lost before it can be absorbed and losses of around 90% are not uncommon. NiacinMax functions best when the strips are used on an empty stomach. Each dose consists of a single strip, which should be placed underneath the tongue and allowed to dissolve. The recommended time to do this is first thing each morning, and people who are able to train three to five hours later are very fortunate because this is when HGH levels will be at their highest. Anyone who has five or more training days per week can also take a strip three to four hours before going to bed, but this is optional, not compulsory. Niacin usage can trigger a reaction called niacin flush. It’s a gentle flushing of the skin around the face, neck, and shoulders that may be accompanied by a little itching. This normally occurs a few minutes after supplementation and may last several minutes. Some people find the sensation quite pleasant, but it may be a shock for anyone who has never used a supplement of this nature before. The unique way the strips deliver their niacin content to the body means the flushing sensation is not as pronounced as that caused by alternative options, but Wolfson Berg state their strips are not intended for women who are pregnant or nursing a child. They also suggest people who have existing health problems seek a doctor’s advice prior to using NiacinMax. They offer the same advice to people using medication. The best place to buy NiacinMax is from the manufacturer’s website. The company does not market the product through any other channels, so if NiacinMax appears to be available from other sources it may be fake. The price is £29.99 and each pack contains 30 strips. Customers who add a second or third box to their orders are rewarded with extra boxes free of charge. Buy two boxes, get one free. Buy three boxes, get two free. Customers are provided with a 67-day money back guarantee. We are very impressed with NiacinMax. Niacin-providing supplements are nothing new, but Wolfson Berg have succeeded in creating a product that can enhance the effect of niacin by using a unique delivery method. We would have liked to have seen some customer feedback but, at the time of this review, the product was new to the market, so a lack of customer feedback is only to be expected. We are confident NiacinMax will do everything that is claimed for it, and the presence of such a long guarantee period ensures customers have nothing to lose, so we are happy to give NiacinMax our stamp of approval. The best place to buy NiacinMax is from the manufacturer’s website. The company does not market the product through any other channels, so if NiacinMax appears to be available from other sources it may be fake. The price is £29.99 and each pack contains 30 strips. Customers who add a second or third box to their orders are rewarded with extra boxes free of charge.